Do you have LEGO® addicts in your home who are also interested in science? What if those LEGO that get painfully underfoot could be awesome tools for learning physics, chemistry, and even coding? Read on to learn how you can use LEGO to tap into your child’s interests, grab their attention, and help them learn science! Whether your child enjoys the LEGO movies, themed sets, or open-ended building, it’s a great way to get cooperation and engagement when working on “school subjects”. If your child doesn’t want to put the LEGO down when it’s time for a new activity, you can just incorporate them into the activity. I’ve met many kids who could play with LEGOs for hours! Having objects to physically manipulate can help kids to focus and model what they’re learning in a hands-on way. You can build and rebuild with them as many times as you’d like. They don’t dry out, shatter, or splinter. They’re also easy to clean! You can use what you’ve already bought as manipulatives and hands-on modeling tools. While you can splurge on dedicated sets for specific content areas, you may get more mileage out of challenging your kids to get creative the pieces already in your collection. 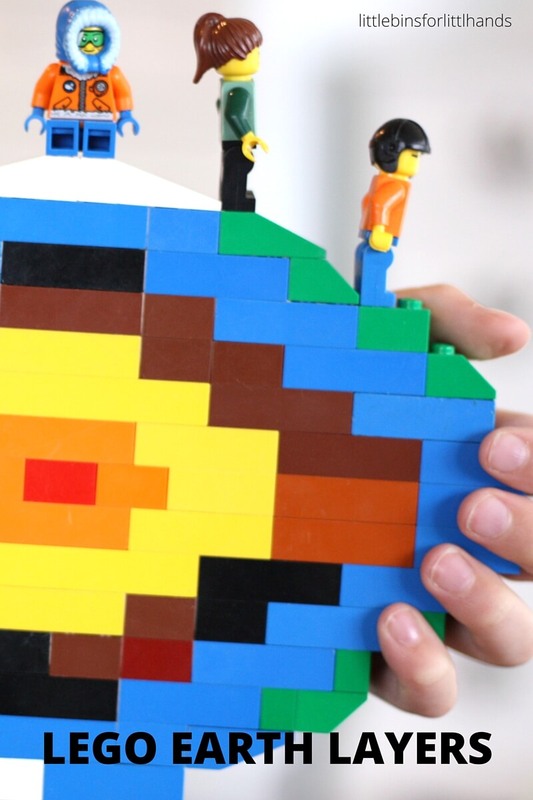 geography and map skills—with LEGO! What are LEGO good for? LEGO comes in a bewildering array of sizes, shapes, and colors. An easy science activity would be to take a pile of them and have your child sort them into groups! Here’s an example with printables that guides the child on how to sort LEGO, but you can also leave it open-ended. Just as there are many potential ways to classify things in the natural world, your child can explore the many ways to group LEGOs. Does it make sense to sort them by set? By color? By shape? Multiple characteristics? Older children can think about their LEGO in evolutionary terms and set up a cladogram. Have them start with a “common ancestor” and group the LEGO according to shared evolutionary traits. LEGO Cladogram – The cladogram begins with the flat gray square, branching off into flat pieces of different shapes and colors. From there, pieces branch off according to how their characteristics differ. STEAM (Science, Technology, Engineering, Art and Mathematics) is more than just a new educational buzzword – it’s a great way of thinking about design, technology, and innovation in a hands-on way. Kids get to problem solve, invent, and explore materials in a way that’s very motivating and open-ended. STEAM can be incorporated into your formal science curriculum, but it doesn’t have to be linked to a particular content outcome to be valuable. Want to get more hands-on, multi-sensory learning happening in your home school? Read “Create A Makerspace For STEM In Your Homeschool” and learn how. Bridges – Challenge your kids to build a bridge that will hold different amounts of cargo and/or span the longest distance. Boats – Can you design a boat that can carry the largest amounts of cargo? 2-D mazes – Use a baseplate and arrange LEGO so that you can guide a car, marble, or magnet through the maze. Marble runs – Similar to the maze idea, but adding in the element of gravity! Gravity rollers – Can your kids build a contraption that rolls continuously? Zipline challenge – Design a car that can travel on your homemade zip line for one mini-figure, then see if you can make the vehicle bigger to accommodate more passengers! Balloon powered car – A fun engineering challenge! Here’s a great way to incorporate LEGO into your science curriculum: using them to represent and visualize what your children are learning. This could substitute for making a diagram or clay model, or work as a nice supplement as a review. For “reluctant artists” like my son, having the opportunity to model phenomena in LEGO is great! He feels confident building with them, doesn’t get messy and feels like he’s “playing” while he’s learning about each topic. Layers of the Earth – This example shows a general cross-section. Chemistry can be challenging for students to understand because it requires them to visualize how tiny particles interact and combine. LEGO are a great way for them to visualize how atoms and molecules “fit together” to form various compounds and generate reactions. The resources provided by the Edgerton Center at MIT are amazing! 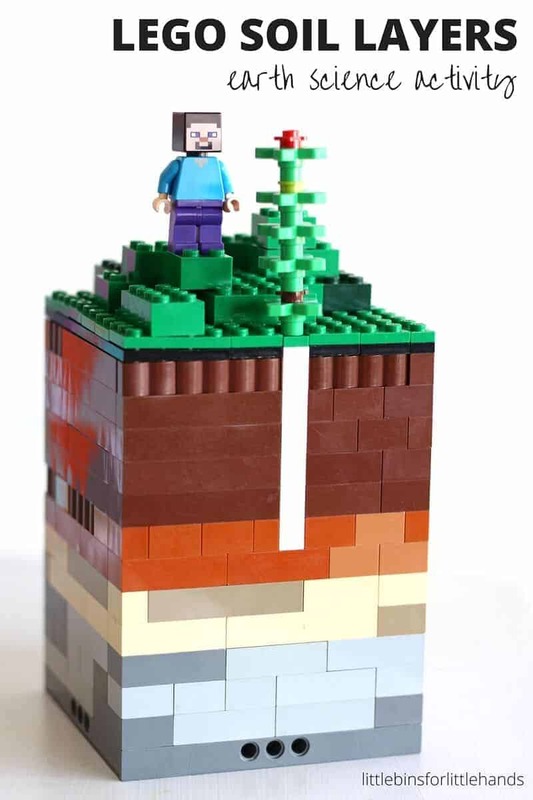 Here’s their lesson for ages 11+ on modeling ocean chemistry with LEGO. The lesson includes a printable PDF showing different colors assigned to different elements, as well as mats to lay out normal ocean chemistry and ocean acidification. Other modules include Understanding Air, Photosynthesis, and Chemical Reactions. If your child is interested in technology, you may find a use for LEGO in coding and programming activities. Secret Codes with LEGO Blocks – This is a fun warm-up activity for coding, as well as an opportunity for spelling and reading practice! Little Bins for Little Hands has a more advanced version that introduces binary. Coding a LEGO Maze – This activity introduces programming on paper, with the LEGO (or Duplo!) as the building component. LEGO WeDo – This is a relatively new LEGO line of products that lets kids use an actual programming language on the computer, for kindergarten through 2nd grade age. It’s the warm up to their more advanced Mindstorms line. Note: It is an investment to get started, comparable to other electronics products marketed to kids. Overall, LEGO are great for visual modeling, hands-on learning, and creativity! What will your kids build today?